I've been slowly working on my 2nd Mordheim band on and off over the last year- getting the figures collected, weapon conversions done, and the most tedious task- cutting off all the integral bases and pinning the feet to custom resin bases. Even though I set myself no deadline and knew since it would be 3rd or 4th priority that it would take a while, its still nice to finally be moving a step forward. I've finished my first two gang members; the fighting monks. The figures are from the Perry Brothers samurai range. 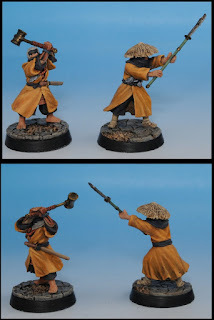 I gave them chinese fantasy weapons from Wyrd, and made the hat out of putty as seen elsewhere on this blog. They fill the role of the Cossacks in the Kislev list I'm basing this off of, so they hate skaven and chaos. I thought that was a good role for monks. I'm shooting for a quick but effective paint job on this gang. I think I pretty much nailed it here, though in retrospect I could have blended their robes a little bit more. Ah well. Progress!